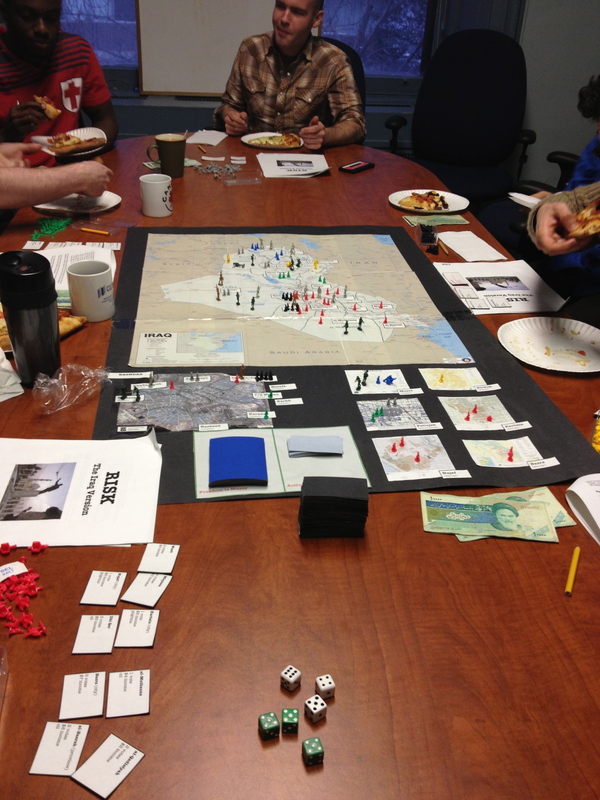 For many years now we have played a game of RISK each year at Montreal’s Interuniversity Consortium for Arab and Middle Eastern Studies. 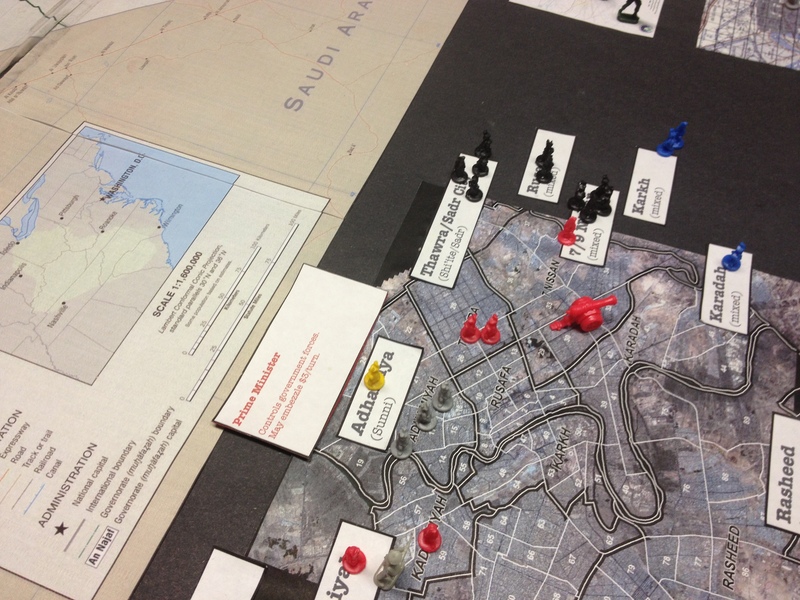 This is no ordinary game of RISK, however—rather, it is loosely based on the political and military situation in Iraq circa 2005. As can be seen below, the board is a giant map of Iraq. The movement zones comprise the various Iraqi provinces, the various districts of Baghdad, and certain other key cities (Mosul, Kirkuk, Fallujah, Karbala, Najaf, and Basra. 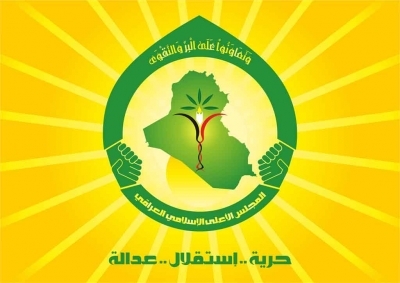 Six players are represented: the (Shi’ite) Supreme Council for the Islamic Revolution in Iraq (now the Islamic Supreme Council in Iraq); the (Shi’ite) Jaysh al-Mahdi militia of Muqtada Sadr; assorted Sunni moderates; assorted Sunni jihadists; the Patriotic Union of Kurdistan; and the Kurdish Democratic Party. 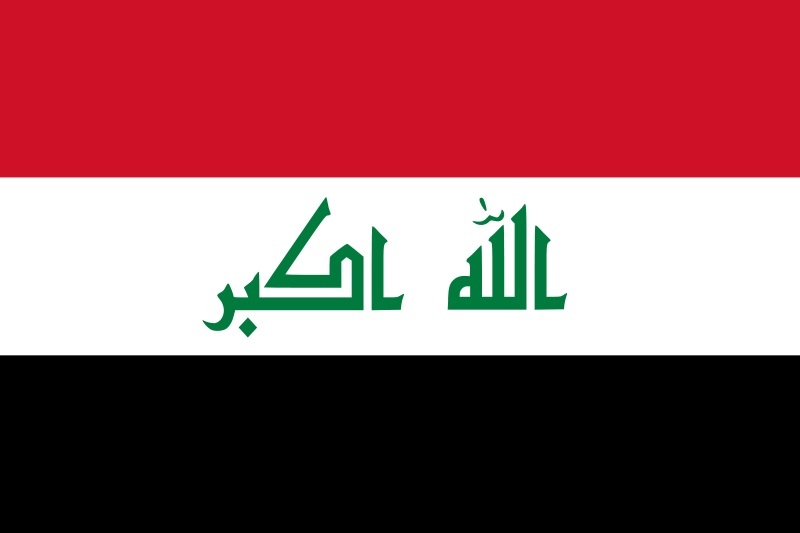 Iraqi security forces are controlled by whoever controls the government. 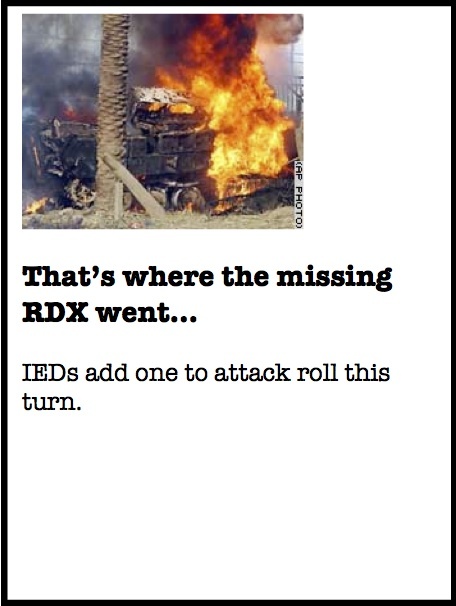 US forces are largely controlled by event cards. 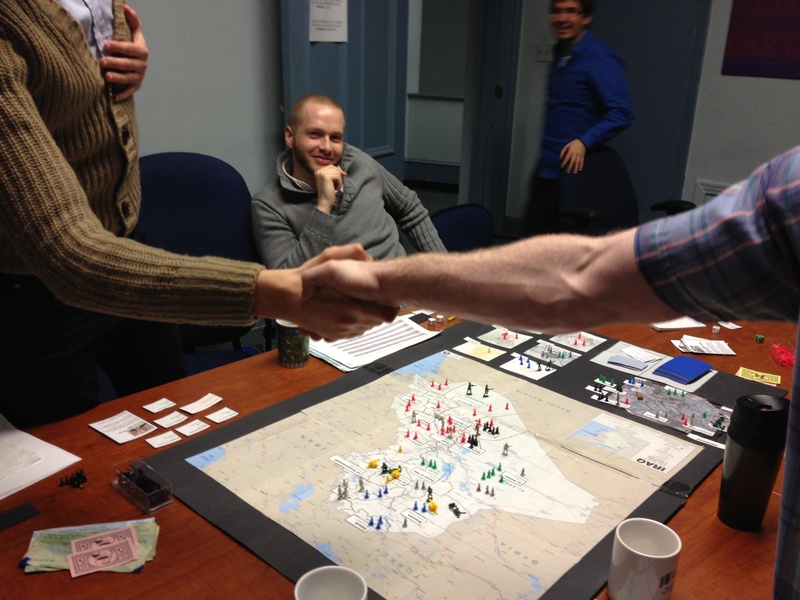 The first turn of Iraq RISK 2013. The units are as follows: red=SCIRI, black=Sadr, green-jihadist, grey=Sunni moderates, PUK=yellow, KDP=blue, ISF=large grey, US=large green, coalition=large brown. Note the Iranian rials! The purpose of the game is to score the most victory points at the end of the game. Different players score different points for different things, but typically points are scored for controlling districts, key cities (Kirkuk for the Kurds, Najaf and Karbala for the Shiites), attacking US troops or forcing troop withdrawal (notably for the jihadists and Sadr), and so forth. Most points are scored, however, by voting on key clauses in the draft constitution. The number of National Assembly votes that a player has, in turn, is largely a function of what areas they control on the map. 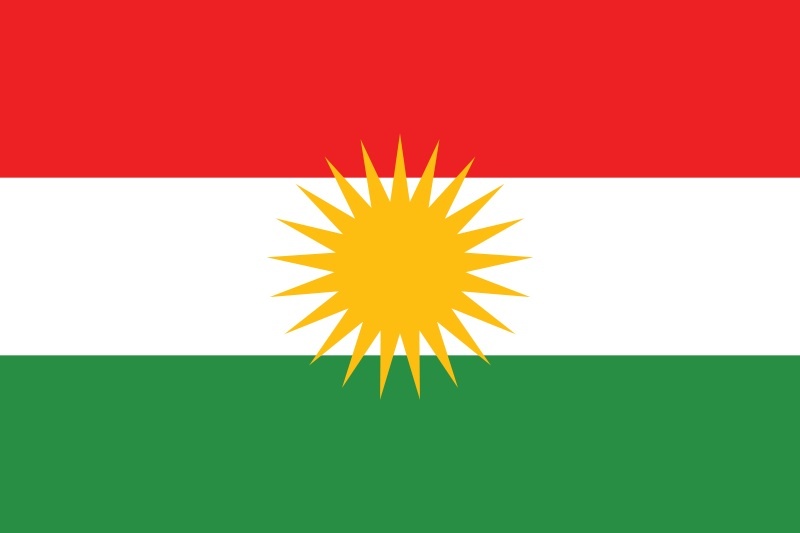 The constitutional issues that might come up during a game include such things as provincial autonomy/federalism, revenue sharing, gender rights, the role of shari’a, the constitutional amending formula, minority language rights, and the status of Kurdish military forces. Some victory point payoffs are hidden from other players, making it difficult to know an opponent’s exact total until the game ends. Areas of the map also generate revenue each turn. This is largely used to buy military units, but can also be used for a few other things, like buying National Assembly votes or bribing other players. Each turn a player secretly draws a wasta card, which enables them to take a special action if they wish. There are a great many of these, including IED attacks, ambushes, and assassinations; arms caches; subversion of Iraqi security force units; oil pipeline sabotage; procedural manoeuvres to force or delay a constitutional vote; vote-buying; and fatwas from religious leaders, among others. One of the most important wasta cards is that which allows a player to forge an alliance with a non-player actor. Possibilities include Iran, Turkey, Syria, Saudi Arabia, the CIA, Mossad, al-Qa’ida, the Iraqi Turkoman Front, the Assyrian Democratic Movement, the Chaldean Democratic Union, the Kurdistan islamic Union, the Iraqi Communist Party, Iyad Allawi, Ahmed Chalabi, and various tribal leaders. These alliances, in turn, bring benefits, like extra income, military forces, or votes. 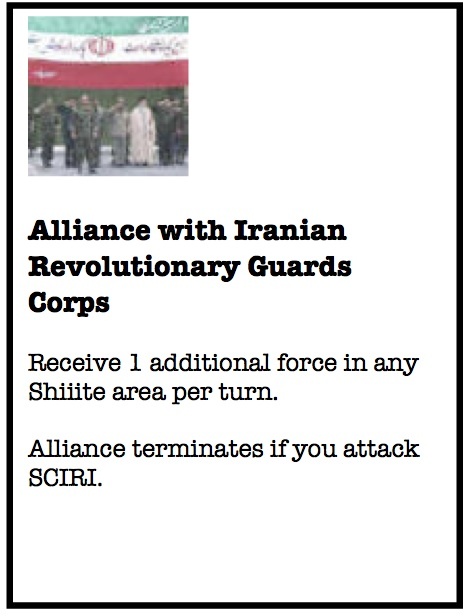 An alliance with Iran, for example, brings $2 per turn for each province held that borders Iran, while the Ahmed Chalabi card allows a player to embezzle money from other players. Each turn a random event is drawn too. 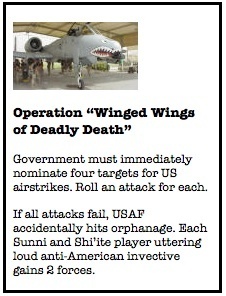 These might involve US military operations, the international community, or various internal developments. One player is designated as the Prime Minister, and they allocate various cabinet seats to other players (or to themselves). Some cabinet positions have certain abilities attached to them, like controlling the Iraqi security forces or stealing public funds. Others just get you a cabinet vote and a nice car. The cabinet can raise new Iraqi military forces, or ask a certain number of US and coalition troops to leave (which earns victory points for some, but not all, players). If the Prime Minister can’t maintain the confidence of the National Assembly, a new PM is chosen. Combat in the game is RISK-like, with some major exceptions. First, units belonging to different players can peacefully coexist in the same space, with the player with the largest force gaining control. 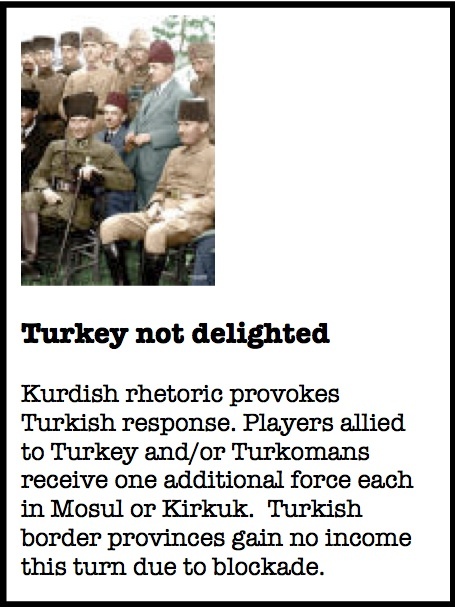 Second, when rolling dice for combat, ties are won by whoever has the ethno-sectarian “home-court advantage” and not necessarily by the defender—thus Kurdish units, for example, win ties in Kurdish areas. When new units are purchased they may be placed in any home area, regardless of who controls it. It is therefore quite difficult to make permanent conquests outside of your own or mixed areas. As might be expected, the game is complex and chaotic, with a great deal of deal-making, back-stabbing, militia clashes, political science-y banter, and heated political rhetoric. In the six years or so we have been playing we have only twice managed to completely finish a game. 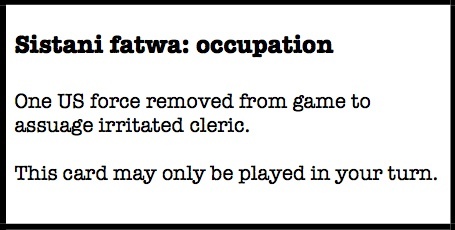 Things didn’t necessarily unfold in Iraq in the way that the game represents: Nuri al-Maliki and al-Dawa aren’t represented, for example, although I might get around to adding a card for him for next year. However, it plays very indeed and we’re not about to make any major changes. The game is always accompanied by pizza, often with Arabic music, and we use a mix of monopoly money and real Iranian rials as the game currency. In the several years we’ve been playing Iraq RISK the Kurds have yet to win, although they have come close. Is this the a function of the brutal realities of geography and realpolitik, or might things be different in 2013? In the hopes that it might help we barred either of the Turkish graduate students in attendance from playing the Kurds this year, and instead assigned two experienced players to the PUK and KDP teams. SCIRI started with the prime ministership, and almost everyone else had at least one junior cabinet portfolio. However, their rather hegemonic attitude and assertive use of the Iraqi security forces soon alienated other players. A political revolt was brewing, with players on the verge of calling a no-confidence motion in the National Assembly to replace the PM. It was at this point that the PUK launched a rather ill-fated two-pronged initiative. First, they hurriedly called a vote on a constitutional amending formula, only to miscalculate their level of support and hand SCIRI a big constitutional win. Then they launched a surprise military assault against their erstwhile Kurdish allies in the KDP. This didn’t go very well, and when the KDP (bankrolled with a generous cash transfer from SCIRI) counterattacked it captured a number of PUK areas. Moreover, the KDP was so outraged by the PUK’s treachery that they spent much of the rest of the game trying to wipe them off them map. In doing so, they threw their political support solidly behind SCIRI, making it difficult for the other players to unseat them from government. With SCIRI firmly in control of the cabinet and constitutional votes going poorly, the jihadists went on a campaign of attacks against Iraqi, coalition, and US units in an attempt to score victory points that way instead. They were quite successful too, racking up an impressive record of military successes before SCIRI belatedly moved against them. The remnants of the once-proud PUK skulk in a Baghdad neighbourhood. After 5 hours of play the victory points were finally tallied up. SCIRI had won, narrowly, over the jihadists. Yes, I know this is the new ISCI (not old SCIRI) flag, but it is so much nicer.